It’s another chilly one today, woke up this morning to -13°. My favorite part of winter? Comfort food and wine! I’m all about the comfort food this time of year. I like the hearty beef stews, casseroles and mashed potatoes as my favorite side dish. It’s a good thing I run. So I’m going to share my Top 5 favorite wines for winter, which happen to pair very well with comfort food. This was my wine of the week last week, based on tasting it in my favorite liquor store. I went back the next day and bought a bottle for Saturday night. I was barbecuing that night and this was the perfect fit. I’m not the only one, as many critics have given this wine 95 points. Great deal. 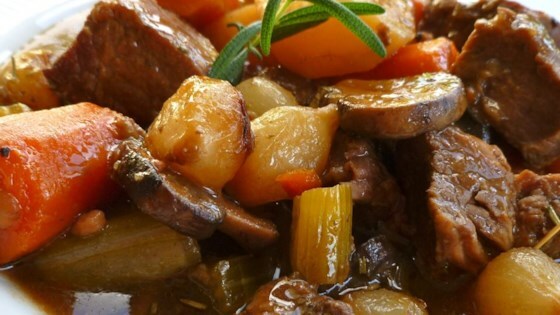 The next day I made a pot of beef stew in my crock pot… it fit even better. Syrah tends to be more on the full-bodied side with intoxicating aromas and flavors on the palate. The structure and hint of spice is a perfect food wine, however, I have to share that this wine tasted pretty good on its own. After all, you have to sip on something while your cooking…. who’s with me? Zinfandel comes in many forms. It can be a stand alone, like this 7 Deadly Zins…. Zinfandel is a great wine for comfort food. Regular readers of my blog know I love Zinfandel with barbecue fare, especially ribs, but it also pairs well with hearty meats like lamb. These great wines come in both medium and full-bodied versions, with big juicy flavors and notes of black pepper. You can understand why it pairs so well with meat dishes. Who doesn’t love black pepper on their comfort food! I know most people think a heavily oaked Chardonnay is the best white wine for your sturdy comfort foods. And if that’s what you like it will work fine, but for my friends who don’t like heavily oaked wine, there are more options out there, one of them being white Burgundy. When you buy a white Burgundy, it is Chardonnay in the bottle, but the french winemakers in this part of France know how to make Chardonny where the fruit shines. Take for example this Premier Cru Montagny. Montagny is the southernmost area in the legendary Cote Chalonnaise, known for exemplary wines. This wine is a great value at just $36, because it is Premier Cru. The Cru’s, Grande and Premier, tell us it is exceptional wine. As a matter of fact, it tends to be the finest wines produced in the region. So to get a Premier Cru for this price is extraordinary. This wine boasts flavors of apple and caramel with notes of citrus, and would be a great wine for your favorite comfort food. I’m having so much fun re-discovering Malbec. Like you, sometimes I get stuck on a varietal and I like buying that same varietal from different countries and different winemakers. Recently I tried Malbec again and remembered how well it pairs with everything. This is the Malbec that had me falling in love all over again. Another 95 pointer from many critics and worth it. Gorgeous structure, rich fruit and spicy notes. Goes with every winter comfort food you can think of. A Bordeaux blend consists of Cabernet Sauvignon, Merlot and then there’s Malbec, Cabernet Franc and/or Petite Verdot is made part of the blend. They are full-bodied and rich on the palate and really the perfect steak wine. The good news is that they can range in price from $20, like the one pictured above, to several hundred dollars. I love them all. I love pairing them with comfort food. If there was a quintessential winter wine, this would be it. Those are some of my favourite wines for winter. What are yours? This entry was posted on January 27, 2018 at 4:11 pm and is filed under Uncategorized. You can follow any responses to this entry through the RSS 2.0 feed. You can leave a response, or trackback from your own site.